CompAndSave.com is all about “being green,” and as your favorite ink & toner provider, we want to make it even easier for our customers to join the movement for a better, greener society. For that reason, we are giving away a new reusable tote bag, this Spring, to every customer who makes a purchase of $50 or more, while supplies last. 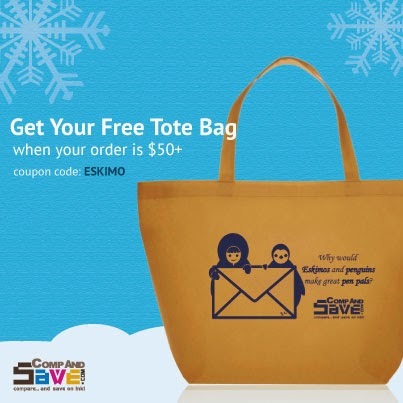 Use coupon code “ESKIMO” to receive one of these newly designed tote bags, for FREE, as a fun and eco-friendly way to reduce the amount of hazardous materials that are poisoning our community. As you shop for the things you need, you can keep a clear conscious knowing that you are doing your part in keeping our environment clean and green. To make this even more INKciting, ascribed on every tote bag is a brain teaser that is sure to keep you guessing. With this new reusable tote bag, stock up on groceries and other items without discarding a single plastic bag which can be unsafe for the environment. Our re-usable tote bags are made of 100% recycled material and are made durable for any occasion. We are committed to providing products that uphold the same standards as their brand name counterparts, and we want to do our part to help the environment as well. That's why our ink & toner cartridges are environmentally friendly, reducing landfill waste while also conserving resources and saving you money. These reusable, eco-friendly bags are another gift to you that helps fight excess pollution in a fun and interesting way. While we release new editions of bags, you can check back here to discover answers to other fun trivia facts and know that you are doing your part to help the environment by purchasing re-manufactured cartridges and using your new reusable tote bag instead of plastic or paper bags on your next errand.